Social media...I hate you but I love you. Instagram can be such a strange, inspiring, wonderful, frustrating place. I want to wring its neck on Tuesday and I wan to kiss its face off on Friday. I've had a really difficult time posting on social media lately. It has been 2 weeks of radio silence and I honestly feel like I could delete it all and be happy as a clam. What's the point of all of it? There are some good moments of positivity for me, but lately I've felt like being in the moment with my family has made me 100 times happier. Last week I spent a good hour scrolling through my Instagram feed and I caught myself in the "grass is greener" trap. I found myself comparing every aspect of my life, both internal and external, to complete strangers. I was questioning my accomplishments, my quality of photos, my worth, my beige walls, everything that makes me, ME! We set this silly "trap" for ourselves and then we fell small. Why, oh why? There is no win in comparison. And there's no love in comparison, either." Comparison is such a happiness killer, guys! Just because we see good in someone else's life, doesn't mean it takes away from the good things in your life. We have to remember we are comparing our behind the scenes with everyone else's highlight reel. Nobody is perfect and nobody has a perfect...even though some pictures portray perfection. So how do I get outta this trap? I put down my phone and started reminding myself what I have, who "follows" & "likes" me in real life, what makes me spectacular and all the talents and blessings I have been given. I started thanking Heavenly Father for making me special. We need to be thankful for what we have and celebrate our little "victories". All I keep coming back to during the new year is "enough". Because we are. I am. You are. I can't just erase my Instagram account because it has become a little business for me. I have collaborations to follow through on and products to take photos of. It has been such a great creative outlet for me in the lonely days of motherhood, but this 2 week break has been so good for my soul. I doubt I will ever stop trying to grow my feed and this tiny business of mine, but it's nice to have breaks once in a while to set new goals of putting down your phone and being present...especially in the 3 weeks before this baby girl joins our family. And on a totally unrelated note, I can't press publish on this post until I mention the cutest maternity shop Audrey & Olive ! This turtleneck tunic is from their shop and I literally can't get enough of it. 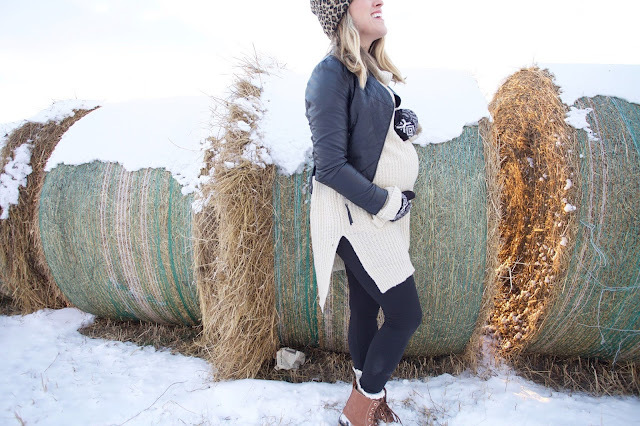 Their motto is "Pregnancy shouldn't mean having to compromise on style" & I love that! Their clothing can be worn pregnant or not, so I'm excited to wear this top after baby girl arrives too! Oh, I love a good shop find and I just felt like this one couldn't go without sharing! Love you and the cute turtle neck sweater you are wearing. The whole look is great!